a. To start the install process, first close the Installation Details dialog Then use the CTRL-3 key combination to bring up the Quick Access dialog. Type the word “Install” and select the “Install New Software” option which appears. b. This will bring up the Plug-in Installer. In the “Work With” input box, enter the following software repository link (http://download.eclipse.org/tools/cdt/releases/8.8.1) and hit Enter on the keyboard. This will cause Eclipse to display the software and updates available from this site. c. In the “CDT Optional Features” Category, select the “C/C++ GDB Hardware Debugging” option and click Next. In the following dialog click Next, accept the License, and click Finish. d. This will install GDB Hardware Debug support into Simplicity Studio. A dialog will pop up prompting you to restart Simplicity Studio. Click Yes. 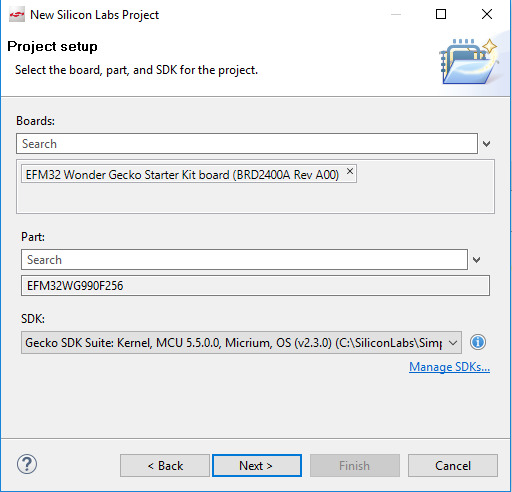 The following steps will help to install the PEmicro GDB server for ARM devices. a. Use the CTRL-3 key combination to bring up the Quick Access dialog. b. Type “install” and select the “Install New Software” option. c. In the “Work With” input box, enter the following address : http://www.pemicro.com/eclipse/updates and hit the keyboard Enter key. d. In the “PEmicro Software” category, select the “GNU ARM PEmicro Interface Debugging Support” as well as the “PEmicro ARM Device Expansion Plugin” option and click Next. e. In the following dialog click Next, accept the License, and click Finish. f. This will install support for PEmicro's Multilink and Cyclone hardware into Simplicity Studio. You will also be allowed to connect all corresponding target devices that are supported by PEmicro hardware. 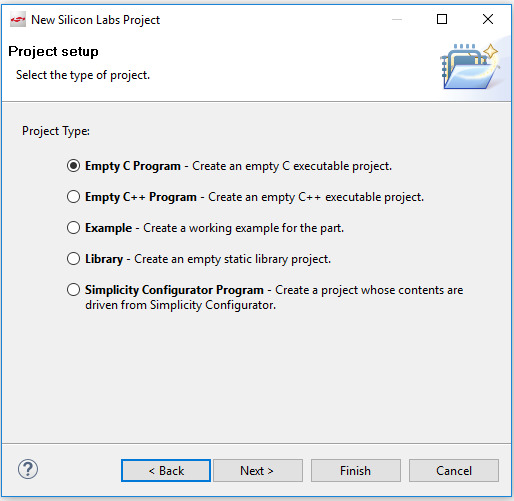 A dialog will pop up prompting you to restart Simplicity Studio. Click Yes. PEmicro debug support has now been added into Simplicity Studio. a. Open or create the EFM32 project of your choice. i. For example. 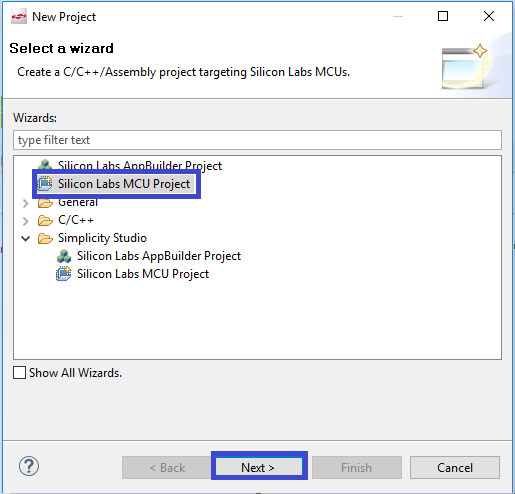 select the Silicon Labs MCU Project option and click Next. ii. Then select your target board you wish to work with under the "Boards" option, as well as the specific part that your target board provides, under the "Part" option. iv. Click Next and name project if prompted, then click Finish. d. This brings up the dialog where launch settings are configured. Normally, you would select the configuration of your choice to edit it. In this case, we have never configured a launch before and need to create a launch configuration. Double click the “GDB PEmicro Interface Debugging” category in the left pane. This will create a GDB PEmicro debug configuration with default settings which need to be adjusted. e. Notice that the C/C++ Application box is empty. This box contains the project that will be loaded (flash programmed) upon debug. As long as the project has been compiled, the search capability can be used to properly configure the application load. Click “Search Project…” to bring up a list of binary files in the project. Choose the .AXF extension (the ELF file) and click OK. i.) Next we need to select the specific microcontroller type to be debugged. This is done by clicking the “Select Device” button which pops up the “Select Target Device” dialog. This dialog shows a tree structure of all supported devices. There is a box where a string may be entered to filter the devices shown (blank = everything). In this example, since we are interested in the EFM32WG990F256 device, we enter WG990 in the filter box to make the selection easier. Select the device to be programmed and click the “Select” button. j.) The GDB Debug Client also needs to be specified to launch a debug session. There is a panel titled “GDB Client Settings” on the Debugger Tab which has a path to the GDB client executable (provided by Silicon Labs). Click the “Browse...” button and navigate to the proper GDB client executable (usually arm-none-eabi-gdb.exe). In this example, the path is “C:\SiliconLabs\SimplicityStudio\v4\developer\toolchains\gnu_arm\7.2_2017q4\bin\arm-none-eabi-gdb.exe”. Once selected, the path is shown in the “Executable” input box. There are many settings in this dialog. Refer to the plug-in documentation for these details. We are now ready to debug. Click the Apply button to save the settings and then the Debug button to launch a debug session.